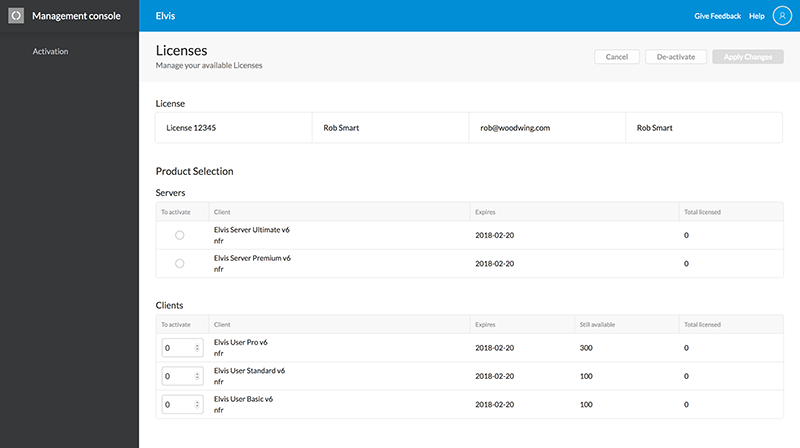 Using Elvis Server and any of the Elvis clients that connect to it requires a license. This article describes how this is done. Note: Since Elvis 6.9, the License page has moved from the Admin pages to the Management Console. Choose the instructions below that correspond with your version of Elvis. Step 1. Install and start the server. Step 3. Enter your serial number, name and e-mail address and click OK.
An overview appears of the products that you can activate. Step 4. Select a Server product. Step 5. Specify the number of licenses to activate for each product. Important: In case you have a Backup license available, do not activate it; these should only be used for activating a temporary system. A Backup license is only active for 30 days and once deactivated cannot be activated again. For more information, see Using a Backup license in Elvis 6 Server. Step 6. Click Apply Changes. A message appears asking to confirm the changes. If all goes well your activation code is successfully activated. 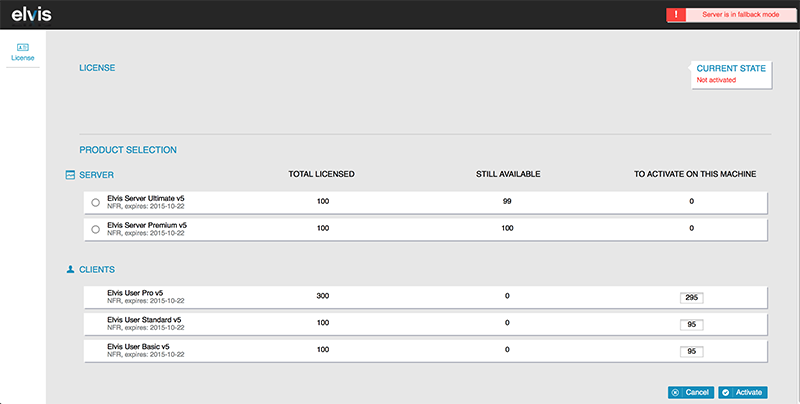 The License page reloads and all options in the menu on the left are now available. When a server is not licensed, it will start up in fallback mode. In this mode, only the admin page and License page are available and only super users configured in internal-users.properties.txt will be able to log in to the admin pages. All other functionality of the server is not available while in fallback mode. Note: The server can also startup in fallback mode when it fails to properly start for other reasons. When this happens it will be indicated on the admin landing page and error details will be available in the server logs. Note: You can log in using the default admin user with password changemenow, make sure to change the password in the internal user properties. 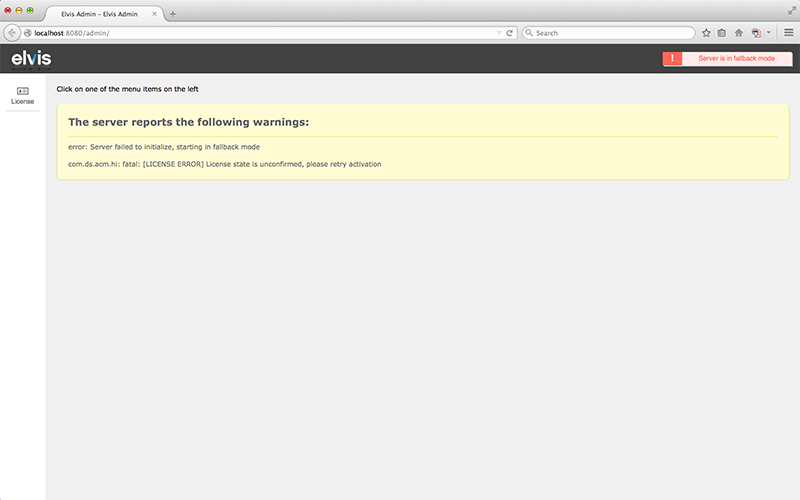 The page will open in Fallback mode (see below) and will display a warning. Step 3. 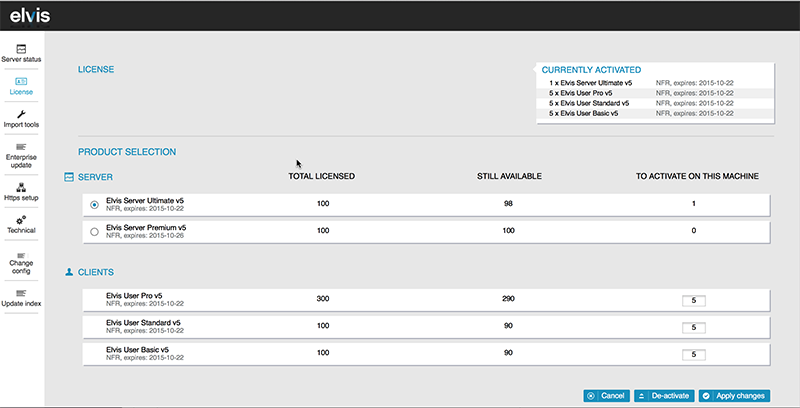 Open the License page by clicking License in the top left corner. Step 4. 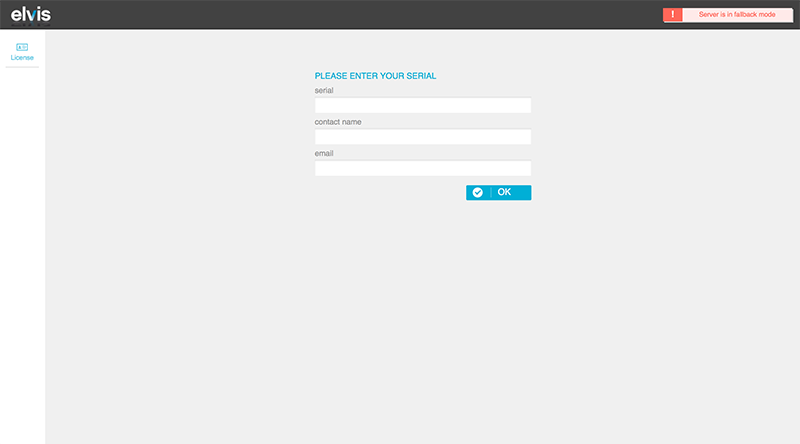 Enter your serial number, name and e-mail address and click OK. Step 5. Select a Server product. Step 6. Specify the number of licenses to activate for each product. Note: By default, all available licenses are entered. 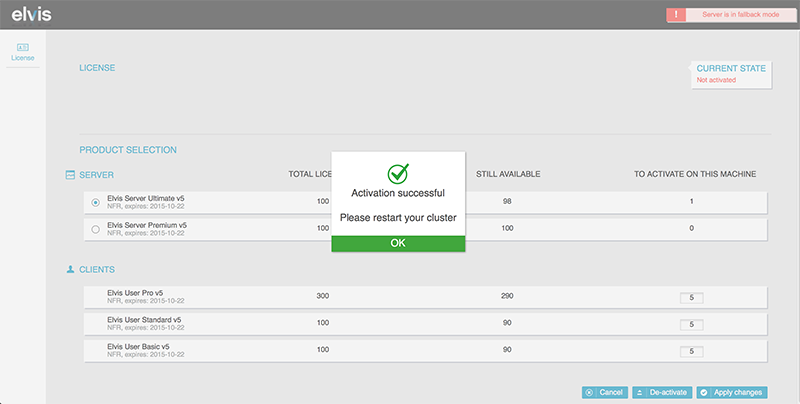 The Activation page reloads and all options in the menu on the left are now available. When a server is not licensed, it will start up in fallback mode. In this mode, only the admin page and activation page are available and only super users configured in internal-users.properties.txt will be able to log in to the admin pages. All other functionality of the server is not available while in fallback mode. On Linux after activating the license, the server does not always restart automatically. You may have to restart it manually (keep an eye on the server logs). Elvis Server will try to contact the activation server each month to renew the license(s). This requires an Internet connection (through port 80). 11 January 2018: Divided article into steps for Elvis 6.9 and higher, and for Elvis 6.8 and lower.